This entry is part 12 of 23 in the series Portugal & Andalusia 2012. 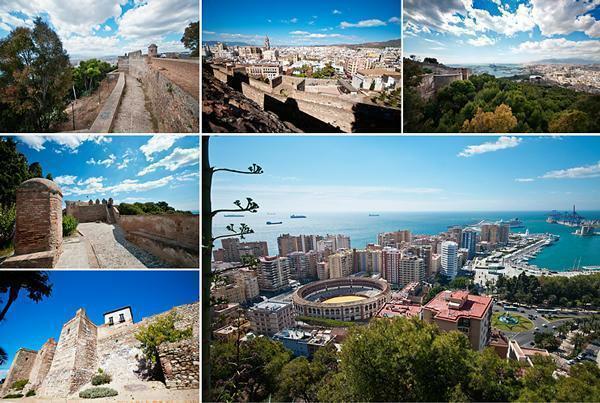 The Alcazaba and the Gibralfaro Castle overlook the busy port city of Málaga in Andalusia Spain. These buildings were our first taste of the Moorish architecture so common to this region, which we would continue to see throughout our road-trip through Andalusia. 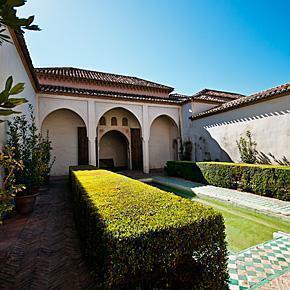 The Alcazaba of Málaga is a fitting introduction to Andalusia’s Moorish heritage. In fact, it is the best-preserved Moorish fortress-palace in Spain, despite being over-shadowed by the grander and more famous Alcazar of Sevilla and Alhambra of Granada (which we will write about soon). 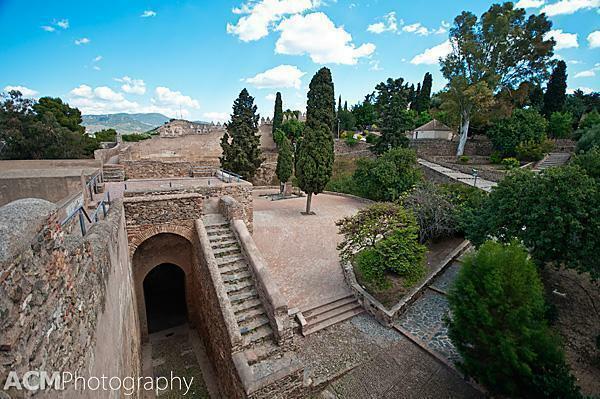 The Alcazaba is actually three centuries older than its well-known neighbours are. The Alcazaba was built around 756-780AD, during the rule of Abd-al-Rahman I, the first Emir of Cordoba, on the site of a Roman fortification. It protected the city from pirates and on a clear day, it is still possible to see all the way to Africa from its commanding position Mount Gibralfaro. 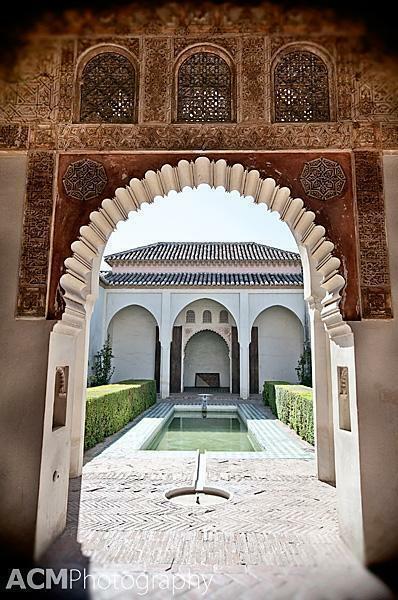 The palace was home to a number of Moorish rulers over the centuries, including the Sultan of Granada and the Nasrid ruler Yusuf I, who both left their stamps on the Alcazaba’s architecture. After the reconquest, by the Christians, the Alcazaba was neglected. Despite this, two of the three original walls remain. 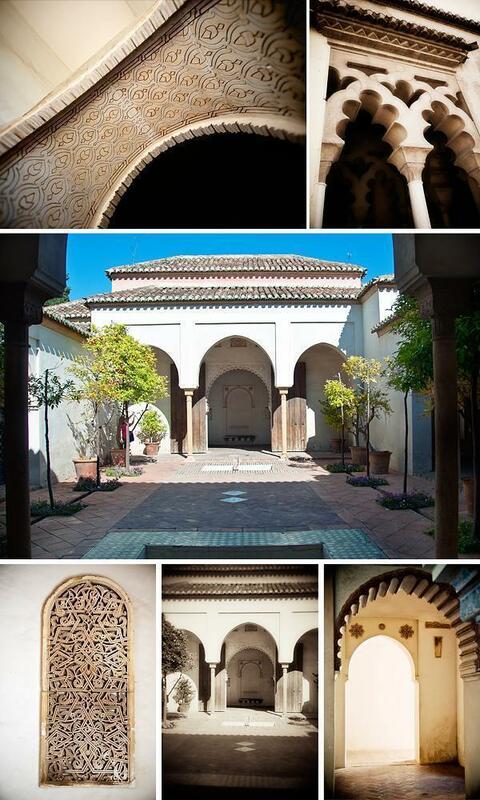 Reconstruction and preservation efforts have been on going at the Alcazaba since 1933. Visits to the Alcazaba begin at the Puerta de la Bóveda (Gate of the Vault). From here, you follow the walls up through a succession of Moorish gates, including the Puerta de la Columnas (Gate of the Columns). The Moors repurposed Roman marble columns to reinforce this archway. As you continue to climb up towards the palaces, you pass through a series of patio gardens. 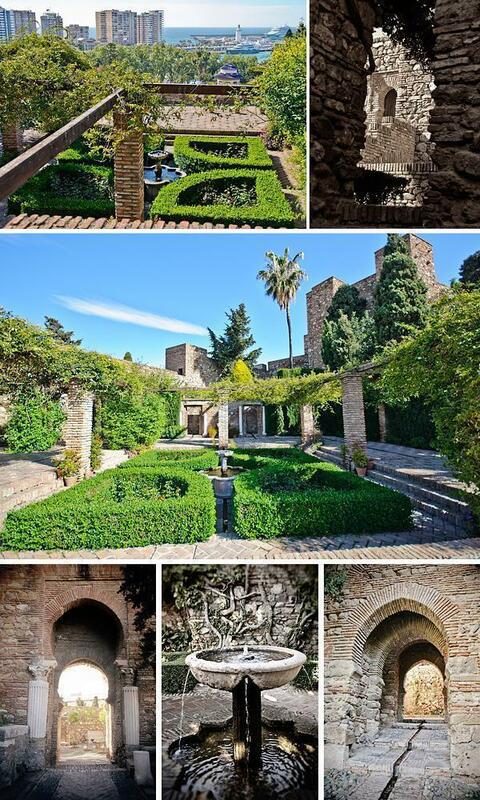 Here you can see the advanced use of water within the Alcazaba. Everywhere there are fountains and channels in the pathways to funnel water throughout the palace complex. You are never far from the soothing sounds of the trickling water that was essential to life here. 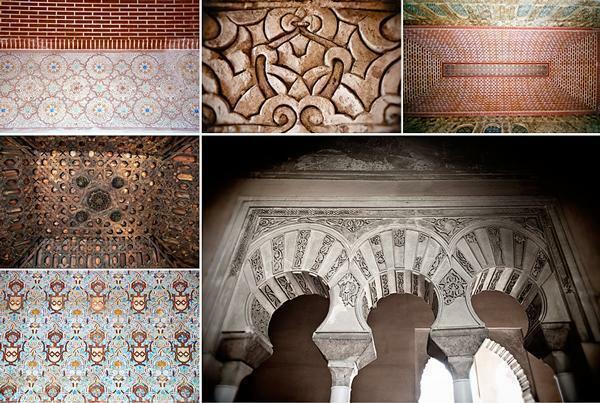 The architectural details in the Alcazaba are striking, although they were just a taste of the Moorish flare for decoration we would soon experience in Granada. The Cuartos de Granada, or the Granada Quarters, was the most spectacular, with its decorated ceilings, multifoil arches, and wall tiles. From the Alcazaba it’s a long, hot trek up the mountain to reach the Gibralfaro Castle, or Castillo de Gibralfaro, but it is worth it for the view. 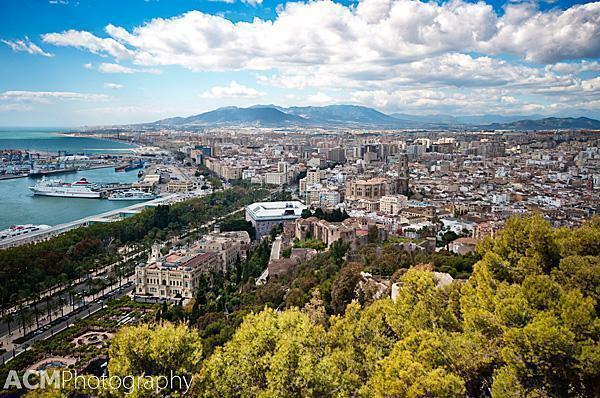 From the castle ramparts, you can see all of Malaga and the Andalusian coast spread out before you. Gibralfaro Castle dates from 929AD. It was enlarged in the 14th century to protect the Alcazaba. The castle is famous for withstanding a three-month siege by the Catholic Monarchs that ended only when the inhabitants ran out of food. These days you can walk along the walls to admire the views of Malaga below and relax in the shady open-air cafe before making the trek back down to the city. Our advice is to head to the castle early or late in the day to avoid the worst of the heat and take some water with you. Alternatively, if you prefer not to walk up the mountain, make the trip on one of the hop-on-hop-off buses that circle the city. Closed Mondays and 1 Jan, 28 Feb & 25 Dec.
Free entry Sundays after 2pm.